aye looks like several instances. Is Avatars integrated as basic functionality? They’re included in the 1.0 branch. I suppose it depends on the template you use to display the avatar. Is there any update on the insanely small text? It appears (according to firebug) that the font size is set to 12px, but then it’s been made smaller by some later style. For me it’s currently looking like a 8 or 9px font size (which is incredibly difficult to read since we dropped the amount of space the text is in by almost 40% to 540px). The margins and spacings look a bit weird/forced as well, almost like it’s using the old version of the 960 grid. Also, as soon as the discussion includes more than 2 posts, 20-30% of the screen becomes useless whitespace. Anyway, I’m testing this on Firefox3.6, latest Chrome and Opera 10 on Windows 7 and vista – and my iPhone. P.S. The blog section’s a total disaster area also, good thing it’s not been updated in over 4 months now – otherwise people might look there for info!!! haha, don’t worry, thats not likely. Love the new look and the fact that _ck_ is around but damn my avatar is ugly that close up. Here’s a screenshot of this page in Firefox 3.0.19 on Ubuntu. Looks the same to me with Chrome on Ubuntu and Chrome on XP as well. Not sure what’s causing the problem for you. I can’t replicate it. Were you using an external CSS mods with the old theme that might be affecting the new theme? Thanks for that Chris, v helpful. Your text seems a tad bigger than mine but I think i might have found some of the issues. 1) The stylesheet specifies “Lucida Grande,Tahoma,’Bitstream Vera Sans’,Arial,sans-serif” and I’m not sure it was tested on all of those fonts. 2) In comparing what I can see on the forums and your screenshot, I’m getting 2extra words per line. Ok, so I noticed a small bug when posting this (because I went to edit and the edit link is tiny). Line 99 of the stylesheet has “font-size:0.8em” (which seems accurate) but according to Firebug it thinks that the 960 reset is loaded afterwards as its loaded via 3 different @import commands (fyi – madness) because of how the browser handles loading of child stylesheets (it’s not concurrent). The 960 reset states that “font-size:100%” for everything. So firebug, and chrome tools will all show that they’re applying “font-size:100%” which in essence they are, they’re just applying 100% of the 0.8em. EDIT: ok, so a bit more investigation turns out that “em”s were decided to be used for some of the links and things on the left under the avatar, while “%”s were used elsewhere, and “px”s were specified for other text – so its really a bit of a mish mash that has high potential to look different on every system (especially as the css reset is loaded 3rd or 4th by the browser); compunded by a choice to use different looking fonts per system. Now according to Firebug and chrome dev tools the font-size:12px is scored out (as if it’s being overwritten) because the reset is loaded after. But if you click on it in firebug to actually disable it, hey presto, the font actually grows to the default size. We basically play about with the font-sizes all over the shop in the stylesheets, and the fonts used too (i can see about 10 fonts listed). Hope this helps whoever is looking after the theme, apprecaite the help as always (especially Chris – first on hand as always). I’m sure someone with more CSS knowledge than me will be able to fix it using this additional information. Thanks for posting it. 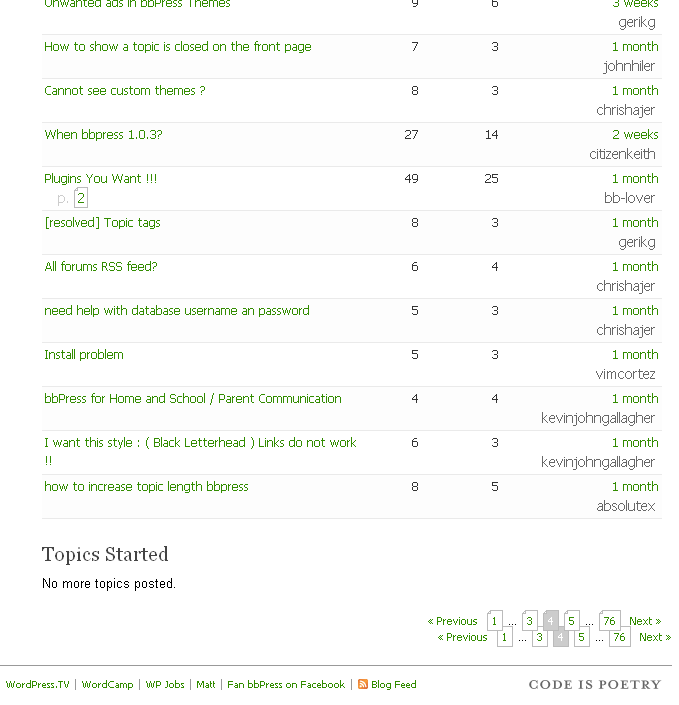 Font size looks good on (IE/GC/FF), big avatars are absolutely nice and fit the forums, the new bbpress 2.0 rocks. This topic has been derailed and I am going to delete the off-topic posts. The design of bbpress.org will not be made available for download, that I know of. It didn’t happen with the last design, but there were many duplicates created. There is a link at the bottom center to “Download Zip Archive”, but I believe if you do that backpress does not get installed. If you can install with subversion, you won’t have any trouble like that, as all externals are installed at the same time. Will install the latest trunk version by subversion into a directory called bbpress. It’s not been looked at in the slightest. Even teh default styles haven’t been applied. If you write some code in a <code> tag. and edit your post, bbPress now puts in <p> and <br /> tags into your code on every line. If yuo’re syslexic like me and struggle with the small font, and edit code based posts a few times to remove errors, you get alot of added code. The new RSS feed has new/added HTML. If you’re RSS reader is a mail client (say google or windows live mail) then it strips these extra tags, but if you’re not using an overly sophisticated RSS client, you see everything wrapped in a <p> tag. From what I can tell, and this may be down to the latest trunk version rather than the theme, it appears to wrap each paragraph twice in the <p> tags. 1) I can confirm the pagination problem when viewing your own profile: at the bottom of the page only, for me. 2) I could not verify this. 5) That is likely from a patch that I committed yesterday. I will have Gautam verify this one. Actually the RSS feed is now working well and looking good, so whatever has changed since Monday worked nicely (great to see the patches coming in – you’re doing great lads and lasses). BTW, I fixed everything in the clone I made. For the topics started, I have no way to verify, but I have topics started going all the way back to the beginning, so unless the list is missing something in the middle (I have far more replies than topics started) I think it looks OK.
Plugins ratin’ doesn’t seem workin’ ! It’s also missing the tag cloud. Hopefully they will test and fixup the plugin section soon! WordPress and bbPress are siblings, and they get along together a lot better than you and your brother did when you were kids! I always thought of bbPress as WordPress’s kid sister. However the alignment of the about page is wonky because of the background image on Customizable Templates. Now the home page isn’t loading, it is redirecting to the install page. The topic ‘Whoa! (bbPress.org 2.0 is live)’ is closed to new replies.